Su Shi (蘇軾, 苏轼, 1037–1101) was a writer, poet, artist, calligrapher, pharmacologist, and statesman of the Song Dynasty, and one of the major poets of the Song era. 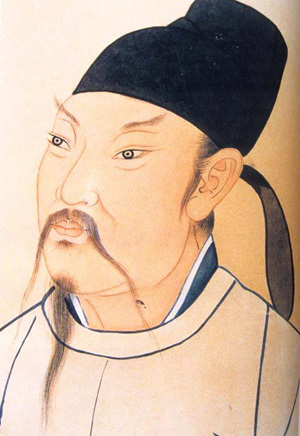 His courtesy name was Zizhan (子瞻) and his pseudonym was Dongpo Jushi (東坡居士 “Resident of the Eastern Slope”), and he is often referred to as Su Dongpo (蘇東坡). Su Shi was born in Meishan, near Mount Emei in what is now Sichuan Province. His father Su Xun (蘇洵) and his brother Su Zhe (蘇轍) were both famous literati. Su's early education was conducted under a Taoist priest at a local village school. Later in his childhood, he studied under his mother, herself a highly educated woman. Su married at age 17. In 1057, when Su was 19, he and his brother passed the highest-level civil service examinations to attain the degree of jinshi (进士), a prerequisite for high government office. Beginning in 1060 and throughout the following twenty years, Su held a variety of government positions throughout China; most notably in Hangzhou, where he was responsible for constructing a pedestrian causeway across the West Lake that still bears his name: Su Di (蘇堤). He had served as a magistrate in Mizhou, which is located in modern day Zhucheng County of Shandong Province. Later, when he was governor of Xuzhou, he once wrote a memorial to the throne in 1078 complaining about the troubling economic conditions and potential for armed rebellion in Liguo Industrial Prefecture, where a large part of the Chinese iron industry was located. Su Shi was often at odds with a political faction headed by Wang Anshi. Su Shi once wrote a poem criticizing Wang Anshi's reforms, especially the government monopoly imposed on the salt industry. The dominance of the reformist faction at court allowed the New Policy Group the ability to have Su Shi exiled for political crimes. The claim was that Su was criticizing the emperor, when in fact Su Shi's poetry was aimed at criticizing Wang's reforms. It should be said that Wang Anshi played no part in this actions against Su, for he had retired from public life in 1076 and established a cordial relationship with Su Shi. Su Shi's first remote trip of exile (1080 –1086) was to Huangzhou, Hubei. This post carried a nominal title, but no stipend, leaving Su in poverty. During this period, he began Buddhist meditation. In Huangzhou, Su Shi lived at a farm called Dongpo ('Eastern Slope'), from which he took his literary pseudonym. While banished to Hubei province, he grew fond of the area he lived in, and many of his considered best poems were written in this period. His most famous piece of calligraphy, Han Shi Tie, was also written there, expressing his loneliness and utmost disappointment. In 1086, Su and all other banished statesmen were recalled to the capital due to the ascension of a new government. However, Su was banished a second time (1094–1100) to Huizhou (now in Guangdong province) and Hainan island. In 1098 the Dongpo Academy in Hainan was built on the site of his residence that was established while in exile. After a long period of political exile, Su received a pardon in 1100 and was posted to Chengdu. However, he died in Changzhou, Jiangsu province while he was en route to his new assignment in the year 1101. Su Shi was 64 years old. After his death he gained even greater popularity, as people sought to collect his calligraphy, paintings depicting him, stone inscriptions marking his visit to numerous places, and built shrines in his honor.